Jamie says: In less than one week, I’ll be moving to my new place! I’m having that “this is my last time” doing (insert local activity here) feeling. Like tonight, it was “this is (probably) my last time eating dinner on the patio.” And yesterday, it was “this is my last time going to this church.” (You get the picture). It’s bittersweet, but I’m certainly super excited about my move. I’ve also been squeezing in a lot of activities, and let’s be real, restaurants, that I’ve wanted to try. My sister told me by the time I leave, I will have I milked this city dry. She made me smile. I like to think I’ve had the full experience. The cool thing is is that I’m not moving too far and can come back. And as my friend at the gym said, I’m about to expand my circle even more. Let the count down begin. 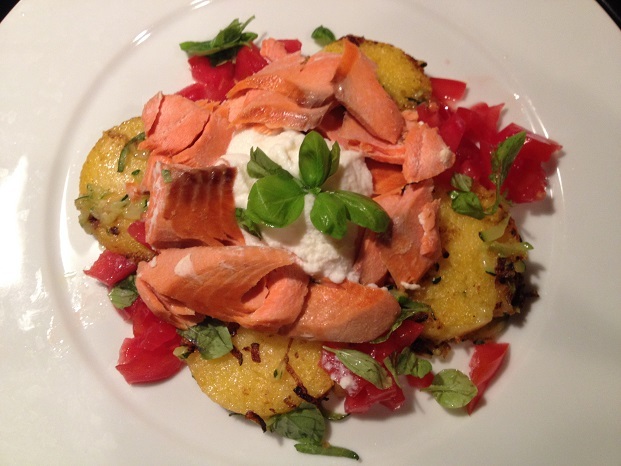 Crispy polenta, creamy ricotta, rich salmon, golden zucchini, juicy tomatoes, and savory basil… yum! Italian flag colors with Italian flavor. Bam! Brilliant colors and brilliant flavors! Slice polenta roll into about 12 even slices. Pour 2 Tbsp extra virgin olive oil in a large sauté pan. Place polenta on top. Using a spatula, flip polenta to coat other side in olive oil. Turn heat on to medium. Cook for about 10 minutes. Flip and cook an additional 10 minutes or until golden brown, reducing heat to medium-low if needed. Place zucchini in food processor to julienne cut. Pour 2 tsp extra virgin olive oil in a small sauté pan, and add julienne-cut zucchini. Cook on medium heat for about 15 minutes or until lightly browned, stirring occasionally. Place salmon in a sauté pan on medium-low heat and cook for about 7 minutes, flip, and cook an additional 7 minutes or until done. Cut into bite-sized pieces. 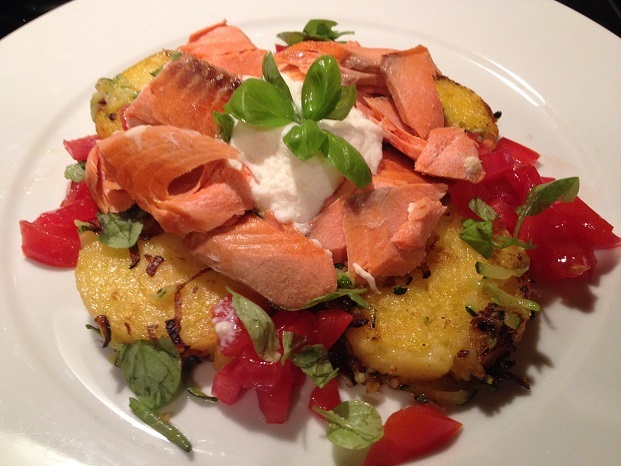 Arrange cooked polenta cakes in a circle in the center of two plates (6 per plate). Place cooked zucchini in the middle of the cakes, and top zucchini with ricotta cheese. 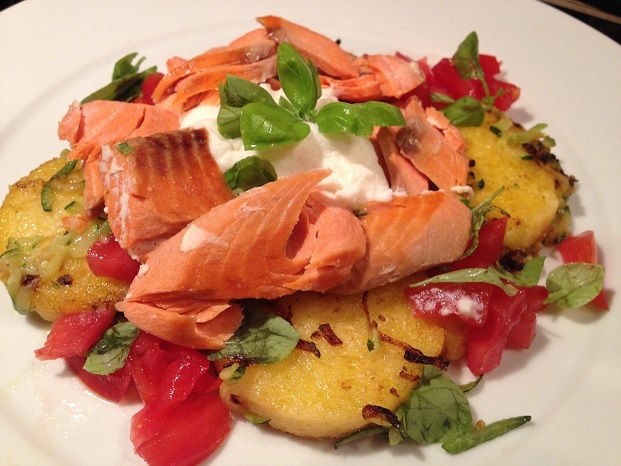 Arrange salmon around ricotta on top of the polenta cakes. Place chopped tomatoes in between polenta slices on the outer ring. Top with fresh basil. Enjoy! Nutrition note: Gluten free (always check the packages to confirm, though) for those with Celiac disease or a gluten-intolerance. No additional salt is needed as the polenta is already salted.